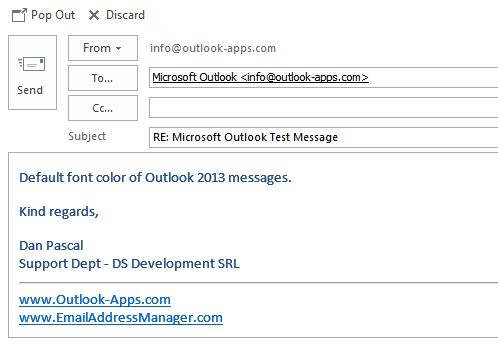 If you need to format your own external texts using that font color, it can prove difficult to find out the exact font color, because Outlook doesn’t highlight the color in the font color picker window unless you select the entire text that carries that color. So, here it is. If you need to format text using the same font style (Calibri, size 11) and the same font color as the default Outlook 2013 email font, you need to use the following RGB (Red, Green, Blue) font color code: 31, 73, 125. Translated to hexadecimal (the preferred color coding method for web pages), the equivalent color code is #1f497d. 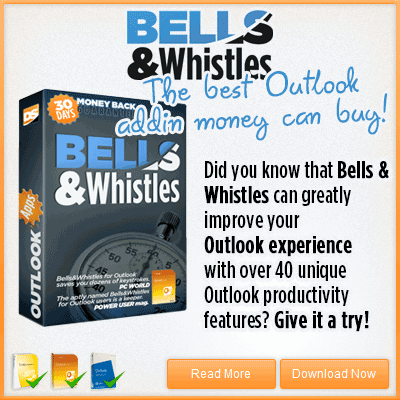 For the Bells & Whistles Outlook 2013 add-in, you may want to use this font color for signatures and boilerplate text templates. I’m so happy you made this blog post. I’ve been googling around for hours trying to find the default blue-ish font colour and only found links for “How to change the default font colour” which was very frustrating indeed. Before tirelessly giving up, I finally clicked through the first few pages of the google search results and I found your blog post. Stellar! Don’t know what happened but Outlook just suddenly decided to change all my font colours to boring black.